Have You Had Your Verve Fix Today? Well, I couldn't help myself. Don't tell anyone, but I usually have to go "in order" and finish up a project I'm working on before starting a new one. But not this time. I just had to use this new Just for You set as soon as I had a free moment. I shoved everything aside and made a tiny spot on my desk to work this card out. I have to say, I think this set is my new favorite (arent't they all?). Before making any Verve cards, I always check out what our Diva, Amber's got going on over on the SCS forum with the Viva La Verve sketches. BINGO! Her week three sketch for June (VLVJUN03) called for a circle and a lot of white space. A perfect match for this card! I did fudge it a little bit and used Confetti Cream (or white?) instead of pure white. I really like the "organic" look to it with the yellow and the natural colored buttons. OH and it smells like chocolate! The sentiment is embossed with scented EP. Sorry ya'll can't smell it through your computer. Scratching and sniffing your monitor is not highly recommended. Join us in the Verve forum on SCS tomorrow night for the Release Party. There's also a giveaway on the blog with all the Sneak Previews and Julee has also come up with 5 sketches to play with during this entire release week for even more chances to win the new sets. Check them out HERE--They're great! 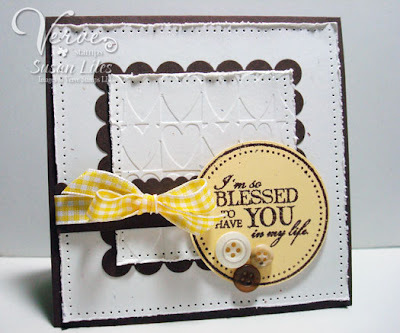 SUSIE Q-TIP: Use a dry embossed panel as your main image to highlight your sentiment. Also, scented embossing powder DOES burn and smell up your studio. I know this for a fact and I don't want to talk about it. Okay, I love that cuttlebug panel. Never thought of that. Thanks for the inspiration and thanks for sharing your talent. This is sooooo pretty!! I really like the sentiment. I'll have to look into this one as I'm sure there is a saying to go with any of my stamp sets.